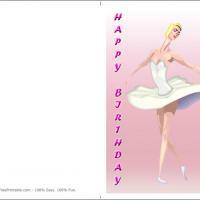 Give this ballerina themed birthday card to a friend or a daughter. These free printable cards feature a lovely ballerina. In fact, these printable birthday cards are simply lovely to give to anyone with their soft colors of pink and white with a beautiful ballerina on the cover. 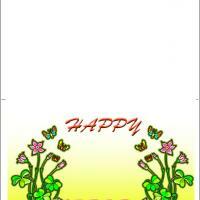 Print this on a hard paper then fold it in half and just add your personal wishes and greetings inside. It's the perfect card to give to both little girls and older females who love to dance or who dream of become dancers themselves. 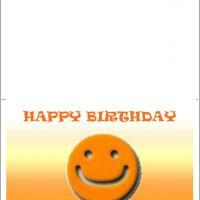 Wish them all the best with this lovely card. The term ballerina is reserved for those accomplished ballet dancers that have exceptional talent. Just for you Ballerina Birthday Card is reserved for those little girls on your list who are exceptional in your eyes. The tall and graceful dancer in her soft white tutu is poised and ready to dance a birthday dance. There will be stars in her eyes when she opens her card of pink. The inside is where you will shine as each card can be set up easily to include an image chosen from our large selection and you may add your own personal words too. Be ready the music is ready to begin. 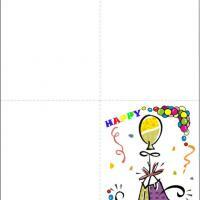 A tall and elegant ballet dancer graces the cover of Just for you Ballerina Birthday Card. She is dressed in her traditional tutu made from yards of white tulle. The background features soft hues of little girl pinks. The budding ballerina on your list will be dancing for joy when she receives your card. And, you will love how easy it is to use our custom print feature to include those personal words you want to share to let them know you care. 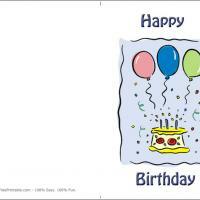 This lovely card and more beautiful free printable birthday cards are waiting for you to enjoy today.